The Elite Travel Gal: Yoga By the Beach? 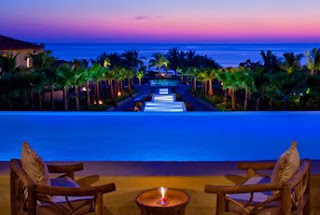 Calling all yogis, golfers and spa lovers for a Memorial Day weekend filled with all of the above at the beautiful St. Regis Punta Mita (one of my personal favorite Mexican beach resorts!). The first in an exclusive Wellness Series to be offered on property this year, the Memorial Day Yoga & Golf Weekend will include a mix of spa treatments, golf, and yoga session taught by Katherine Roberts--a fitness expert and regular contributor for The Golf Channel. She is also the official yoga instructor for the Los Angeles Dodgers and the San Diego Padres! Yoga & Golf takes place May 27-30 and includes three nights’ luxury accommodations; three rounds of golf on either of Jack Nicklaus’ two signature courses; daily pre- or post-game yoga sessions on the beach taught by Roberts; a 30-minute one-on-one private session with Roberts, who will analyze guest’s swing to help provide certain yoga techniques to improve flexibility and swing; a 90-minute Better Swing Golfer’s Massage at Remède Spa; and complimentary daily breakfast at Marietas Restaurant. Rates for the Yoga & Golf Package start at $1,450 per person for a three-night stay based on double occupancy. For more details or to reserve your spot for this special weekend, email me at stacy@elitetravelinternational.com or call us at 310.979.9036. Hope to see you there!